A dramatic opening to any show, our illusions are big, bold and original. We have a long list of managing directors appearing (and disappearing) all over the country! 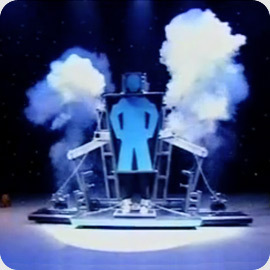 Our illusionists can perform a variety of spectacular effects at your event (space permitting). The vanishing elephant, the appearing jumbo jet and sawing a woman in half are just a taste of what we do. A large scale magic show combines danger, illusions, dance and drama woven together with state of the art music and lighting to create the most spectacular show on a grand scale. Nothing is impossible as our illusionists remove the head from a living person, cut a person into six or even make a car appear while surrounded by members of the audience. Of course, we've the skills and expertise to create tailor made large scale illusions too. Imagine your managing director appearing in a puff of smoke before their keynote speech or how about levitating the bride on her wedding day or teleporting a guest from another country to join in the fun. When they're not cutting people in half or walking through walls, our illusionists have create original magic for film, TV, theatre and stadium shows all over the world. They have a weath of experience in making the impossible, possible! So if you have an idea for a stunt, illusion or special effectthat you would like to explore further, call our illusion designer boffins. They like a challenge and they'd love to help.